BXP Makeover Challenge: 100 Proof Fun! The intensity of a distilled alcoholic beverage is measured in its proof – or the amount of alcohol it contains. It isn’t a measure of quality but a measure of potency – the higher the proof, the greater the amount of alcohol. Recently we had the pleasure of participating in the BXP Magazine Makeover Challenge, and it was one of the most intense and exciting experiences we have had in a long time and one where the taste of victory is pretty high proof. For the past 14 years, the challenge has used the branding needs of CPG companies as the basis to invite selected design firms from across the country to solve their creative problems. 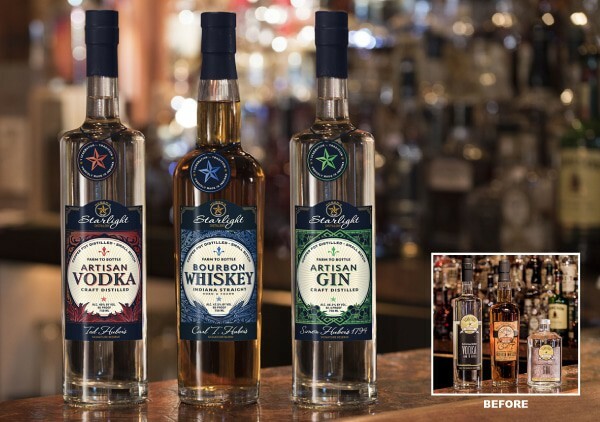 This year kismet happened to pick BrandDirections as one of the three agencies to compete – developing a design and branding solution for Indiana-based Huber Starlight Distillery. It was both fun and rewarding to see how our team pulled together to solve the design problem provided by the Huber team. In spite of being a competition, we responded with our standard process. We began with the core team working to discover the unique customer challenges and at the same time learn a great deal about bourbon, vodka and gin – and the challenge of creating a unique and distinctive brand that worked on shelf as well as on the back bar. 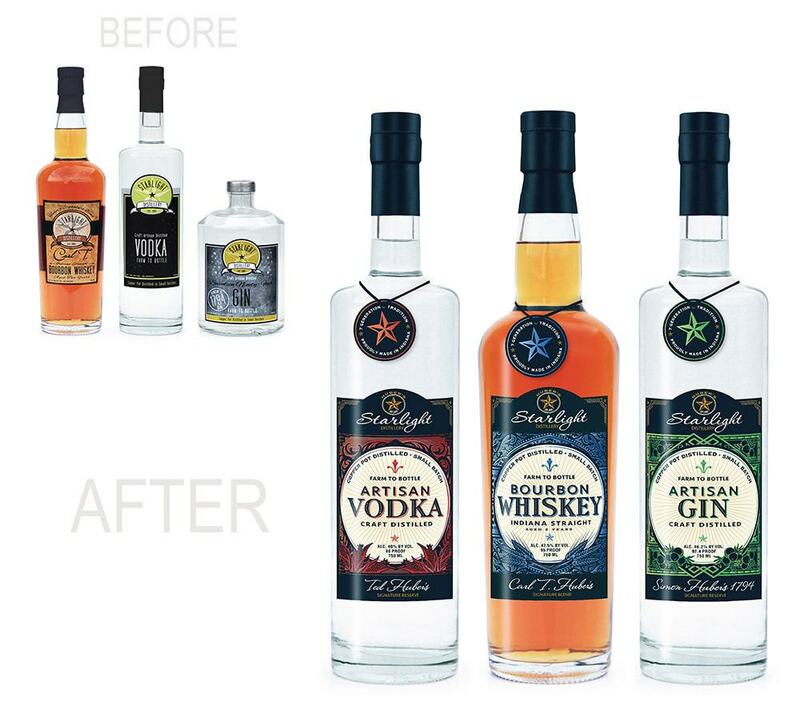 In short, we needed to create a look that Huber Starlight Distillery could own in a very crowded category. For weeks we wondered how our design stacked up against our competitors, and how each agency responded to the challenge at hand. We wondered, had we pushed hard enough, or did we push the look too far, did we hit the challenge on the mark or would it fall short? The wide variety of design approaches offered by the three firms in the competition made the decision making tough even for ourselves, so when we found out we won, it felt like we had won big. We have always felt confident in our design and branding approach as we work with customers to define core brand image and messaging and this was no exception. We are gratified that our proposed solution showcases our design expertise, as well as the influence design has on consumers. We want to express our thanks to those that make this challenge work each year, beginning with a big thanks to BXP Magazine and challenge sponsors. This is a major effort that provides a great opportunity for design firms to compete and yet have fun in the process. There is something about having the unbound freedom to design outside of the normal business environment, to take a few more risks, a little more time to research and dive into customer motivations on our own (ask the bartender at the local bourbon bar), that makes this undertaking very refreshing. Second, another big thanks to our incredible team that created way too many options to choose from – it was hard to offer up only one concept for the competition. You are an incredible group of professionals that consistently deliver best in class solutions for our clients. Third, thank you to Craig Augustine Photography and Copperstill Bourbon Bar for their valuable support. Lastly, thanks to voters for their readership of BXP Magazine, and for taking the time to evaluate and comment on concepts from all of the agencies. Critical review is important to the process as we work to craft effective branding for packaged products. I would encourage agencies to enter the competition next year. This is a great way to invigorate creative teams, break out of your paradigms and challenge your skills. You meet a lot of great people in the process and learn new and exciting things. Hopefully, the work you do will challenge and inspire others in our field and help customers better connect their stories to their consumers.